Earlier today the Auckland Council Governing Body adopted unanimously the Auckland Transport Alignment Project (ATAP, also see: #ATAP Is A Go and South Auckland Picks Up Major Wins with the Government and Council Announcement) and in a 15-2 vote (4 absent) adopted the Regional Fuel Tax to go out for consultation. Aucklanders will have the opportunity to have their say on the future of Auckland’s transport system when public consultation on a proposed Regional Fuel Tax (RFT) and the projects it could fund begins 1 May. 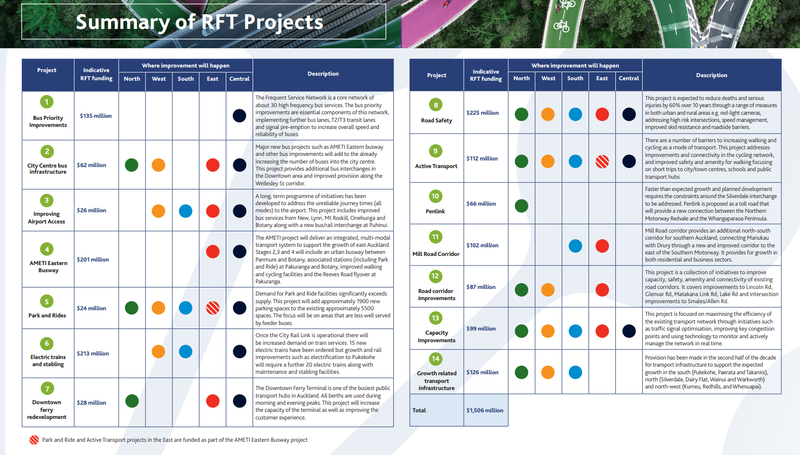 It follows the council’s Governing Body agreeing to a draft proposal for a RFT, detailing 14 projects that it would fund. Auckland Mayor Phil Goff says, “Fixing transport in Auckland is a priority and the regional fuel tax will enable more than $4 billion of investment in critical transport infrastructure that otherwise wouldn’t be possible. “This consultation will allow Aucklanders to see and have their say on how we intend to improve our transport network and exactly where their dollars from the proposed RFT will go. “The proposed projects will increase the capacity and accessibility of public transport across the region. “It will see major investment in bus services and bring forward busway construction in East Auckland from Panmure to Botany. “It will strengthen bus infrastructure in the central city, enable the redevelopment of the Downtown ferry terminal and create bus priority lanes across Auckland. Airport access will be improved, and more much-needed park and rides will be built. “We will procure more electric trains, along with the facilities we need to house and maintain them. “Safety improvements will be made to our rural and urban roads, while cycleways and walkways will be boosted to promote safe, healthy active transport that will reduce Auckland’s carbon emissions. “Major roading programmes like Mill Road and Penlink will begin, and road corridor improvements made to a variety of routes including Lincoln Road, Lake Road, Matakana Link Road and Glenvar Road. “It will also enable road sealing, particularly in the Rodney region, while capacity improvements will be made to existing networks and infrastructure created to allow new brown and greenfield housing developments. The draft proposal agreed today follows the release last week of the Auckland Transport Alignment Project (ATAP), outlining Auckland Council and the Government’s shared plan to invest $28 billion in Auckland’s transport infrastructure over the next decade. Final decisions on the introduction of a RFT will be in June. Visit akhaveyoursay.nz from 9am 1 May to provide feedback on the proposal, as well as the Development Contributions policy, and Auckland Transport’s Regional Land Transport Plan. I will be running a post on the Regional Land Transport Program tomorrow.